Last year, 8 percent of home sellers statewide opted to sell their home on their own. For some of these homeowners, 38 percent to be exact, they were selling to friends, family, or someone they already knew. The majority of them, 62 percent, sold to someone they did not know. What were the results of these "for sale by owner" (FSBO) properties? On average, it ended up costing them $60,000 on the sale of their home. Don't take our word for it. Look at the data. The California Association of Realtors pulled data from home sales statewide and, of those that were sold by their owners, the sellers left between $60K-90K on the table. There is a theory being spread that, in order to sell your home, you don't need all the fluff that ends up costing you. Let's give you the quick and dirty of what this "fluff" does for you, and why it might actually have some substance. 1. Multiple Listing Service (MLS). Sure, modern home sellers might think Zillow is enough, but if you know someone in the real estate industry (which let's face it, all of us do), then you know Realtors aren't looking on Zillow. "But the average, tech-savvy consumer is," you might say. While, yes, the average consumer is beginning their search online, 92% of buyers last year used an agent. If your home is not listed in the MLS, chances are, your home is not seen by a good majority of the buyers out there. In a transitioning market such as now, this means the sharks of the industry (investors) are targeting your property because they know you probably aren't getting many offers, let alone showings. 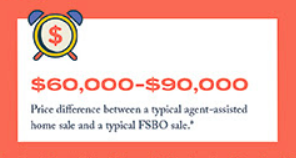 Not only do they have the negotiating prowess, but they know the FSBO market and they know, after so many days on the market, that seller may be getting desperate for an offer. 2. Clout. Enough said. Why do you think some of the largest real estate teams have either joined a major brokerage or become a major brokerage? Clout. No one individual can do what an international brand of over 97,000 agents and offices in 47 countries can do. No one individual gets over 140 million online video views and has the No. 1 most influential real estate brand on social media. No one individual sells $147 Million in luxury sales per day. Sure they can market their property online, but what's the reach? 3. Experience. It's no secret that there are A LOT of agents out there. Everyone knows someone that's an agent. But of those agents, about 10 percent sell 90 percent of the inventory. Therefore, it's important to do the research and interview the right people. Just like selling a home shouldn't be done on your own, it shouldn't necessarily be done with the agent down the street either. Look up reviews and get references; don't just take their word for it. When you find the right agent for the job, you'll understand that their experience cannot be matched. Just like you wouldn't go to court without representation, you shouldn't list your home without representation. You may have negotiating skills in your own line of work, but do you think a Realtor could negotiate the deals you do? Probably not. The same goes with negotiating on your home. Selling a home is an emotional journey and those emotions can often get in the way. Hiring the right professional, you can rest easy knowing there wasn't money left on the table.